Fast, effective strategies--each teachable in 10 minutes or less! Includes printable patient handouts and audio downloads for guided relaxation practices. Empower your patients quickly with tools that range from relaxation strategies to life skills. Teach patients to recognize their stress response and use proven techniques to reduce their exposure to stress. 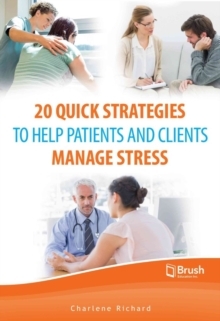 Each of the 20 strategies described in this practical guide includes a script to teach patients how to use the strategy and a printable patient handout. Patients can use the audio downloads at home or right in your office. Whether you are a health care professional, social worker, or student in a health care program, this book will provide you with strategies you can use to help patients immediately. These methods work. All have been used in a variety of settings, including primary care and community health clinics, mental health centers, addiction treatment facilities, community counseling agencies, domestic violence shelters, and secondary and post-secondary health centers.